When did your little one show an interest in starting solids? 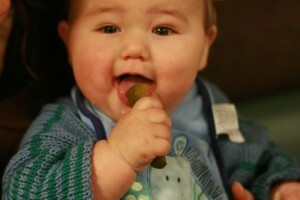 Did you do baby-led weaning? What were your little one’s favorite foods? 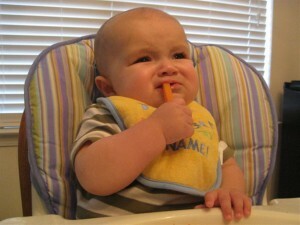 Derrick on his Baby-led Weaning Adventures tackles carrots. 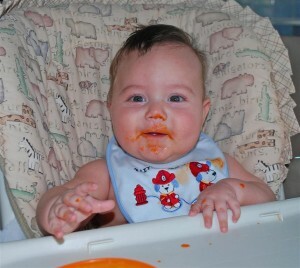 Amanda's 7 month old son, Connor, gets a Sweet Potato Surprise. Amanda blogs at Amanda's World of Motherhood. 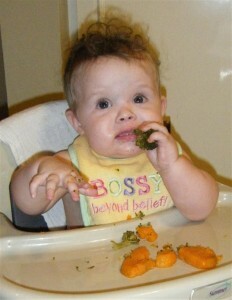 Momma Jorje's Sasha noshes on broccoli and sweet potatoes. Sara's little one, Julia, enjoys some fresh fruit. Kieran was much more interested in the spoon on this morning than he was in the oatmeal. Kieran's mama, Dionna, blogs at Code Name: Mama. Blake digs his carrots! Blake's mama, Angie, blogs at Create It Fabulous. 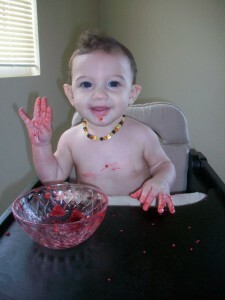 Annabelle enjoys some organic raspberries at seven months and just a few weeks into her adventure with baby-led weaning. Her mom, Melissa, blogs at The New Mommy Files. Brotherly love! BigBrother gives Bear a bite of carrots. 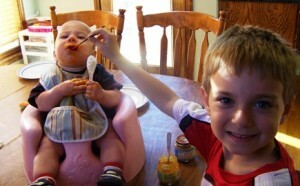 Laura, the brothers' mama, blogs at WaldenMommy. I think I would go with the fresh fruit. Such cute pictures of little ones learning to eat. 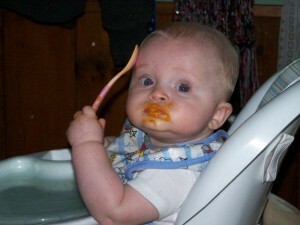 My son LOVED sweet potatoes…I couldn’t feed it to him fast enough. We did everything by the book with Carter. Love pictures of babies eating. Those are adorable! Great pics. Its so great to capture those moments. When you look back on them it really brings warmth to your heart. OK, the expression in the first picture is my fave! How cute and I love the idea for including all the pictures. Happy Wednesday! How adorable! Love those pictures! Thanks for linking up! My second one was interested in foods fairly early, and we gave him whole foods (baby-led weaning, though he is still nursing at age 4!). I remember I gave him half a sweet potato and he chowed down. He ate what we ate, though I used to say he was getting the “essence” of things, because he didn’t often swallow a whole lot!! I think it was around 3 months of age and was rice cereal. Of course this was over 37 years ago! I was not able to BF & he was a premie that had digestive problems with all the formulas I tried by that time, so I was using what DH mom used and he was still hungry, so I added very weak, liquid cereal at bedtime…Same thing repeated with #2 5 years later, go figure? 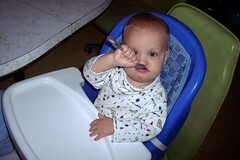 Mikko loved to chew & taste foods — but the whole swallowing thing eluded him till after he was a year old. 🙂 Good thing he was nursing all that time! (And still!) Baby-led solids made life so easy for us, though, because we could just give him bites of what we were eating. He got a good variety that way, too — more than he’ll eat at age 3, for sure. Pickles are a no go now. Sigh. Look at those beautiful babies! 🙂 Great post! I’m with Lauren. 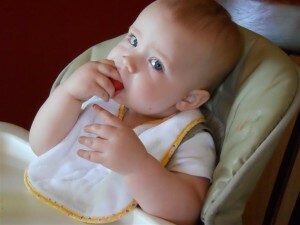 I started sharing solids at 6 months and generally ate the same thing she was eating. She still eats directly from my plate now (at 14 months). She also has the same swallowing issue. I have seen several articles in my email (for 14 month olds) lately warning that toddlers may lose interest in food and may not sit still for a meal. While the articles say not to worry because growth slows at this point as well, I haven’t had any trouble! I just don’t make Sasha strap into a chair to eat. She can sit in my lap and have bites. She gets down when she needs a break and comes back when she wants more. I’m sure someone would say I’m a bad mother for letting her play with a mouthful. Oh well!